Lacquer Lockdown: Hot Off The Stamping Press: MoYou London Hipster Collection Expansion! 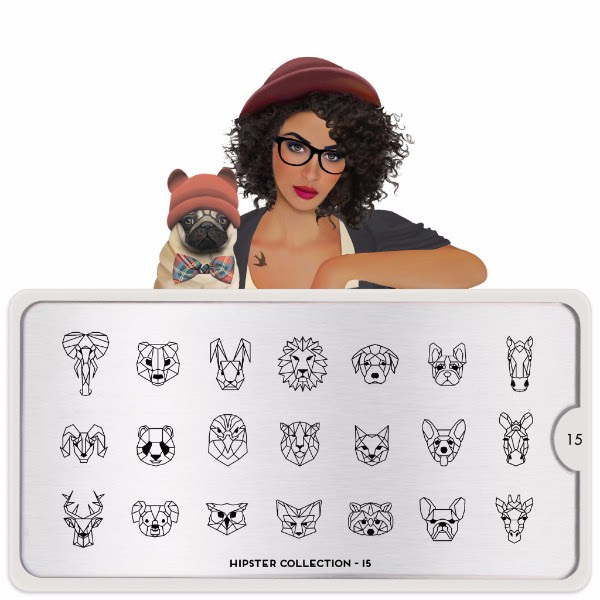 Hot Off The Stamping Press: MoYou London Hipster Collection Expansion! It's the first MoYou London plate release of 2016! And its from the oh so cool Hipster Collection. Oh yeah baby ;) This is a collection that I kind of nitpicked from when it first released. Some of the plates were like my besties bbf for life. Others I was like not sure what's happening here - I don't really want to wear bearded nails. These kinds of thoughts were ruminating through my head. So I wasn't really sure what to think when I saw this collection was expanding, but maybe that's just me. Let's go! Ok ok. Some basic patterns could be cute for a little color on color or as parts of my Simples pursuit. Not really sure about the bearded hatted men that remind me slightly of Rabbi's which is 50:50 funny versus disturbing. I don't want to disrespect anyone's religion! But you see what I mean right? I love the antlers here and the little birds! Kawaii kawaii! Um these pugs and more bearded men though...A while ago Uberchic Beauty made a Far East plate that made my eyes roll back in my head from plategasm. However it featured this tiny little panda with eyes that stared straight from the plate into my soul. I found it creepy in the extreme. I feel the same exact way about these pandas and the pug dressed up as men :/ The abstracts on this plate and fantastic though especially the one wit the triangles and deer antler rack, but I cannot get over these weird animal headed men. It's just strange IMO. Good lord they made more of them staring directly at us and burning holes into our souls! I love the abstracts bikes, glasses, and shoe images, but again I hate this animal head men. Also I would never want to wear these on my nails if I were being totally honest. Finally a normal and cool plate! I don't know what it is about the Hipster Collection but I really like their repeated imagery - the antlers and arrows, the little quote bubbles, and pizzas. It's all so cute. However, the images on this plate are too small for me even now that I'm keeping my nails shorter. See? Super cute! It even has what appears to be tiny little Iphones.